My very own vanity offers the play value of larger sets in a compact size! 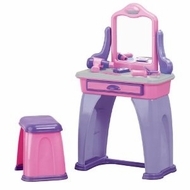 This nine-piece vanity set includes a bench-style seat, mirror, storage drawer, comb, three hair accessories, cell phone, curling iron and hair dryer. Measures 18.25" x 9.5" x 30.25".